When in Manila and in search of something cool that you and your friends can do, head on over to Gandiva Cafe and Archery Range for an experience that you’ll surely not forget! By 2008, Gandiva has worked hand in hand with the Department of Education by giving free Armory Clinics in the different regional meets. Primary purpose is to orient coaches and archers nationwide with the variety of archery equipment that could fit their budget. To date, Gandiva has reached out to 14 regions, 67 provinces and 29 municipalities/cities. It has hosted different events namely, the 3rd Asian Grand Prix and South East Asian Championships, 1st Highlander Invitational Archery Tournament, Pasig Summer Sports Clinic and the Manila Polo Club Archery Open, and has offered free equipment tuning for the three Palarong Pambansa to name some. In March 31, 2009, the first Gandiva Store officially opened at the SM Mall of Asia, Pasay City. This is the first Archery Pro Shop in the country. Currently they have a second branch in the heart of Ortigas Center which not only houses an indoor archery range but also a vegetarian restaurant that serves amazingly delicious food (I’ll talk about the cafe in a separate post). Gandiva Archery is open to the public and offers lessons ranging from beginner’s to advanced. 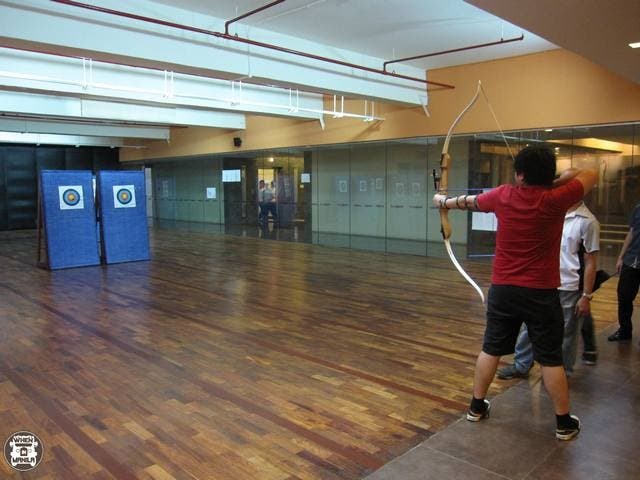 However, if you don’t want to avail of the lessons and just want to shoot arrows, you may do so at a hourly rate of P600 (inclusive of trainer and safety gear). Oh, did I mention that the trainers are the same guys who train the Philippines’ archery team? Before I started, I was asked to put on an arm guard and finger guard for safety reasons. After that, I was good to go! As you can see, I can’t shoot arrows to save my life. If I were lost in the woods and had to depend on hunting for food, I’d die. Seriously, I’d just die. But whatever! The fact is, I had a blast and am pretty sure you would too! Nothing beats trying to relive your childhood and pretending that you’re Robin Hood. Also, it doesn’t matter how sucky your hand-eye coordination is, as long as your bow and arrow are aimed at the target and not at another human being, then you should be good. On the other hand, my friend Luis did better than I did, he hit the bull’s eye the first couple of times he shot… Good job! For those who feel like they want to pursue archery after realizing how fun and awesome it is, Gandiva Archery also has a store on site wherein you can buy whatever equipment necessary. They also have a lounge area and locker rooms for men and for women. So when in Manila and in search of something cool that you and your friends can do, head on over to Gandiva Cafe and Archery Range for an experience that you’ll surely not forget!